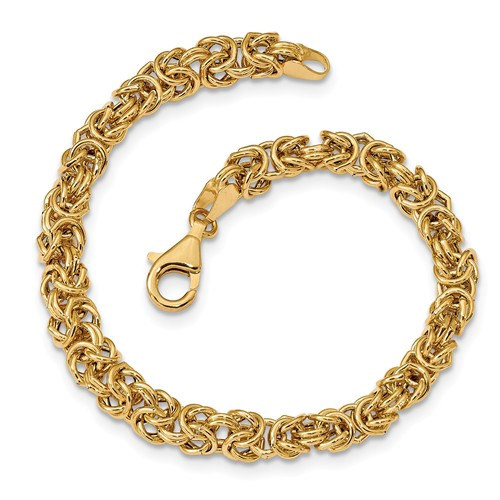 This beautiful Italian Byzantine Bracelet in 14K yellow gold from Apples of Gold Jewelry features a lovely chain link like design, with a beautiful construction that is made in Italy. The warmth of the 14K yellow gold makes this bracelet irresistible, and the fashionable lobster claw clasp closure adds a special amount of charm to this pretty jewelry piece. Coming in at 5.28 grams, the width of this Italian made Byzantine bracelet is 5.4mm in size, and the bracelet measures in at 8 inches in length. 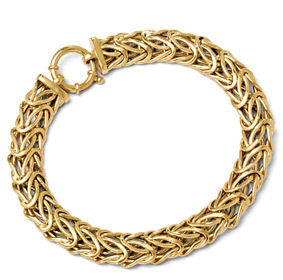 We guarantee our Italian Byzantine Bracelet in 14K Yellow Gold to be high quality, authentic jewelry, as described above.